THE SCUBA CLUB & SCUBAPRO are excited to launch a new Computer Upgrade Promotion! The SCUBAPRO mission has always been to provide every diver, from recreational to technical, with the best equipment to get the most out of their dives. Our current Dive Computer Trade-In Upgrade Program is a perfect way to get our latest technology. 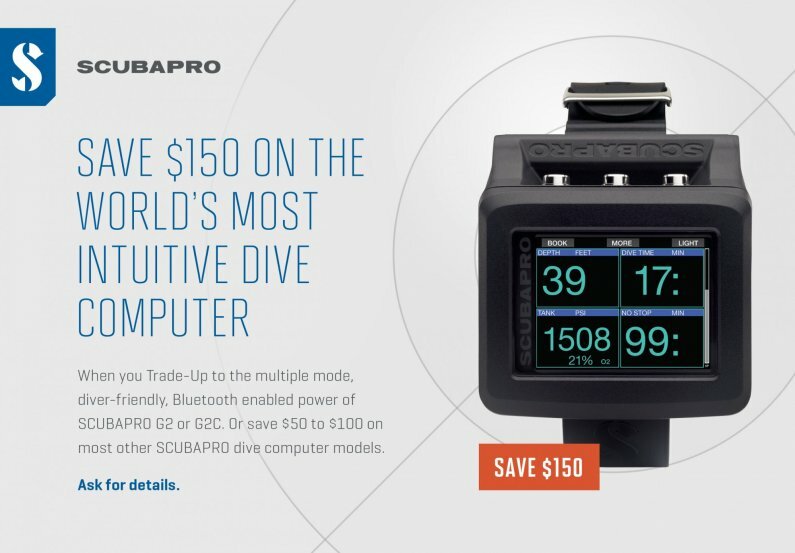 To participate, bring in any dive computer to us, to receive up to $150 off a new qualifying SCUBAPRO computer. When you upgrade to the new G2 series. You will enjoy one of the world’s most intuitive dive computers, where every dive experience becomes an opportunity to explore and do more underwater. Multiple modes allow the G2 to adapt and evolve with your skill level. Bluetooth capabilities wirelessly connect to and get the most out of all the latest dive apps. Vivid, intelligent display. Heart-rate monitor. Sleek, ergonomic design. With $150 savings, your dive starts off in the right direction.